The 2015 1/4 oz Gold Canadian Maple Leaf coin is available via Silver.com in brilliant uncirculated condition. 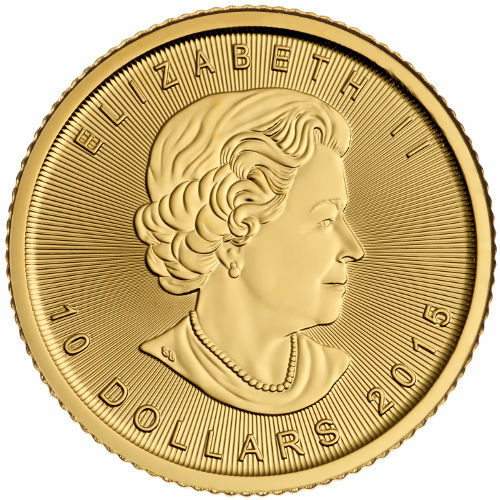 Every coin contains one quarter troy ounce of pure, .9999 fine gold and is legal tender in Canada with a face value of $10 CAD. Each 2015 fractional gold maple leaf coin now features all new radial lines as a defense against counterfeiting. Features a value value of $10 CAD. 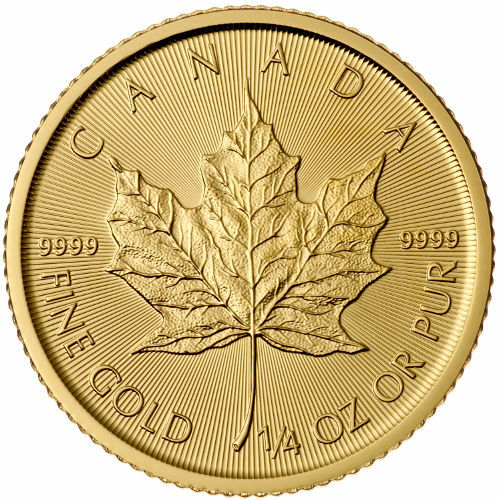 The Gold Canadian Maple Leaf is one of the more unique gold bullion coins in the world. It is not unique for its design, but rather for its quality, purity, and intriguing backstory. During the 1970s, leading economic powers used their considerable clout to enact an economic boycott on South African products to push the nation to abandon its system of Apartheid. The Canadian government introduced the Gold Canadian Maple Leaf to counteract the boycott of the South African Krugerrand. 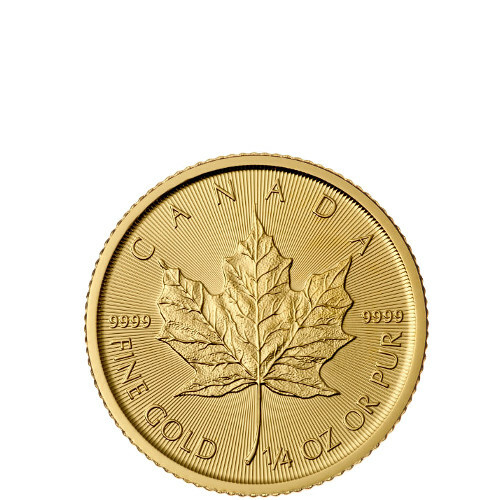 Gold Canadian Maple Leaf coins quickly ascended to the top of the heap in the world of gold bullion products. South Africa’s Krugerrand was the most popular gold bullion coin in the world prior to the boycott. The Gold Canadian Maple Leaf was introduced in 1979 and has been produced every year since that time with the same designs on the front and back of the coin. On one side of the coin, the image of a solitary maple leaf. Over time, the level of detail on the leaf has improved to include intricate levels of detail. On the opposite side, Susanna Blunt’s 3rd-generation portrait of Queen Elizabeth II is featured on the coin. The reverse side of the 2015 1/4 oz Gold Canadian Maple Leaf features the image of a solitary maple leaf. Engravings surrounding the leaf include “CANADA,” the weight and metal content of the coin, as well as dual-engravings of the coin’s purity (.9999) on either side of the leaf. Queen Elizabeth II’s image on the obverse side is surrounded by “Elizabeth II” above her head, along with the face value and year of minting of the coin. The Royal Canadian Mint operates two facilities, with one situated in Ottawa and the other in Winnipeg. The mint was originally founded in 1908 to handle the increased level of gold arriving from the Yukon Territories. Today it is solely responsible for the production of Maple Leaf bullion coins as well as currency for the nation of Canada. At Silver.com, we value your experience shopping with us. You can contact an associate with any product and purchasing questions by calling 888-989-7223. Our staff is also accessible directly on our website by using our online live chat feature.